And there you have it! Those are all the remaining covers for Selectiony books. It's a little strange to have them all out there, but I'm still looking forward to you getting to read all these things hiding behind these lovely covers. THE GUARD will (I hope) help everyone see Aspen's logic, THE SELECTION STORIES will have some exciting bonus features that I seriously cannot wait to gush about, and THE ONE... well, it's everything I hoped it would be, and I can't for you to see how it all ends. What do you think of the covers? Shout out in the comments! You guys asked, and we delivered! 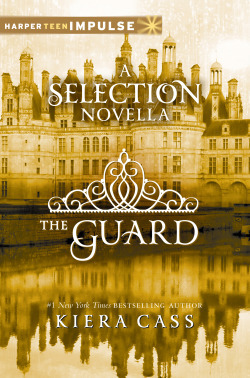 I’m stoked to announce The Selection Stories: The Prince and The Guard AND The Guard coming to you February 4th, 2014! The Guard is another e-novella, this time telling part of The Elite from Aspen’s point of view. I feel like Aspen gets misunderstood a lot, so I can’t wait for you to see America through his eyes. Coming out simultaneously with the e-novella is The Selection Stories. Now, this will contain both The Prince and The Guard in printed format, a sneak peek at The One, as well as some deeper information on the entire series compiled by yours truly! So many of you have asked if Maxon’s story would be made available in paperback, and now it will be right along with Aspen’s. But, if you’re happy with your e-copy, and only want to get The Guard, that option is out there, too! I’m really excited about all this, and I can’t wait to share every last scrap of information I can before The One comes out May 6th. Hope you guys like it! Or pre-order The Guard here! I'm coming to the Philippines! Ahh! I’m so thrilled to finally announce that I am coming to the Philippines this August! I’ve been sitting on this news a while, ABSOLUTELY dying to tell you all about it. I’ll be in Manila on August 3 and Cebu on August 4, so if you’re in the area, please come out and see me (and Callaway). I have to give a massive thank you to the wonderful people at National Bookstore for putting on these events and for being so helpful in organizing everything over the last few months. Even though I’m TERRIFIED about the flights, I can’t wait to see you there. My readers in the Philippines have been some of my sweetest, so I’m packing extra hugs for you guys. If you have questions, I’ll try to find answers for you as soon as I can. Otherwise, see you next month! RSVP to the events on Facebook here! So proud to announce that THE PRINCE is #6 on the New York Times bestsellers list. This is a pretty big deal as it *might* be the first e-novella to do so. Thank you, guys! This only happens because of you! A lot of people asked, so I thought I would share. The mystery girl in The Prince... is named Daphne. So you want to read a bit of The Elite? Well, I don’t blame you. Because it’s awesome. And the lovely people over at HarperTeen agree! So, here’s the deal, if you buy the paperback version of The Selection (due out March 26th), it comes with the first chapter of The Elite! I know, right? But it gets even better. 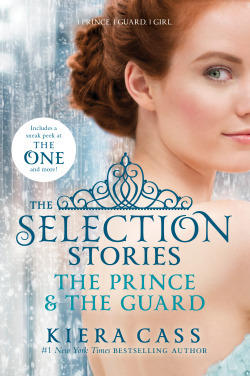 Maybe you already have copy of The Selection and would like to read even MORE of The Elite EARLIER than March 26th. Well, cool. If you order my e-novella, The Prince (due out March 5th), it comes with the first TWO chapters. A reminder! The Prince will only be available in e-format. If you do not have an e-reader, you can still access it on a computer or with something like a Kindle or Nook app on your phone or tablet. Before Aspen broke America's heart . . . There was another girl in Prince Maxon's life. . .
Don't miss this thrilling 128-page original novella set in the world of the New York Times bestselling novel The Selection. 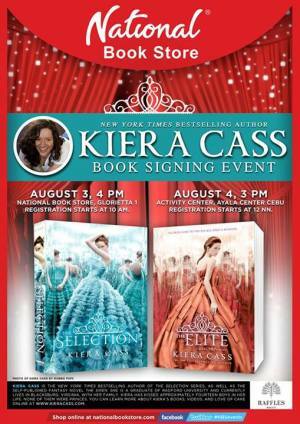 Also features a teaser to The Elite, Kiera Cass's hotly anticipated sequel to The Selection. To summarize: In less than two months, you will be able to have a portion of The Selection told through Maxon’s POV via The Prince AND read the first two chapters of The Elite. Pre-order, baby! Pre-order! I’m so pleased to show you the cover for THE PRINCE! Reminder, this will only be available in e-format, coming March 5, 2013! If you haven’t read THE SELECTION yet, you might want to! 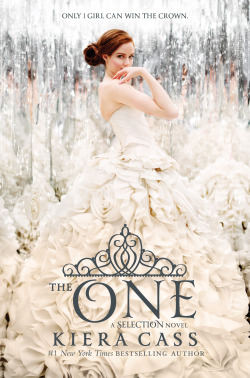 THE PRINCE is a portion of that story from Maxon’s perspective. What do you think? Alright, I want to make things official about The Prince. 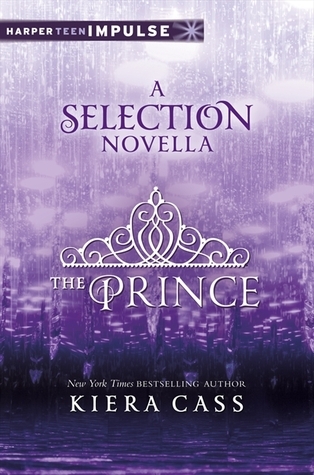 The Prince is a novella I wrote to accompany The Selection Trilogy. It’s basically a short story that takes place within the timeline of the first book. The Prince came about mostly because of my wonderful editor, Erica Sussman. As we were editing The Selection, she asked all these fantastic questions. Some of them led me to start looking at things the way other people in the stories would see them. In the end, I wrote two scenes from different POVs, one from Aspen’s and one from Maxon’s. The Prince is taking that scene from Maxon’s perspective and elaborating on it. If you’ve ever wondered what the whole Selection thing looks like through his eyes, then I think you’ll really love this. It will be out exclusively in e-format (which, if you don’t have an e-reader, you can still access on your computer) and should be released March 5, 2013, just before The Selection comes out in paperback. I seriously can’t wait to share. I’m almost as excited about you guys having this as I am about handing over The Elite next April!